These delicious and filling protein balls taste like a peanut butter oatmeal cookie, but have 4.4 grams of protein in each 100 calorie ball! What’s better than having a peanut butter cookie and an oatmeal cookie? A peanut butter oatmeal cookie of course! Duh. Add chocolate chips and you’re at near perfection. So, since I’ve had a downright obsession with protein balls lately, I made this epic combo into ball form. Delicious enough that they’ll satisfy a cookie craving yet filling enough that two of these tasty treats will stave off hunger for a few hours. And they’re made with healthy ingredients too: oats, dates, peanut butter, cinnamon, and protein powder among other goodies. If you’re *really* being good, you can leave out the chocolate chips, but I love adding them. It makes the protein balls taste that much more like a cookie. Protein balls are all the rage these days in the health food world. I can’t seem to flip through Instagram without seeing at least a ball or two. I’m not complaining whatsoever. And get your mind out of the gutter, we’re talking about protein balls and protein balls only here. Although I admit, I have the maturity level of an eighth grade boy so that probably won’t last throughout this post. It took a few tries, but at this point, I’ve got the recipe just right. There’s the perfect amount of peanut butter, sweetness, oats, and chocolate in every bite. So much yum. As you can see below, these protein balls didn’t stand a chance in the fridge. My husband is not to be trusted when it comes to balls I guess.  But seriously! I leave them unattended for half an hour in the fridge and come back to the plate you see below. I got jacked. And he doesn’t even like peanut butter! I’ve been making a batch of protein balls about once a week lately. We have had these oatmeal cookie balls, the other recipe for protein balls I posted in January, or some form of random new ball recipe that I’m experimenting with in our fridge almost nonstop. Anyways, back to balls. I use my Ninja Prep mini bowl, but any blender or food processor will do. The only thing to note is for those of you lucky enough to have an ultra powerful fancy blender, make sure to just pulse the oats in quickly so they don’t pulverize too much. For the rest of us with ghetto blenders, you’re good to go. This recipe is somewhat flexible in terms of switching out nut butter types, and/or replacing a little of the oats with flax or swaps along those lines. Be careful when playing with too many of these switch outs though or you might end up with some dry, not so tasty balls. I had a batch turn out pretty gnarly after doing some swaps and switching up quantities. For play it safers, just follow the recipe as written and you’ll be fine. The beauty of this recipe (aside from health benefits) is that, unlike most cookies, you only have to get one bowl dirty. Hurray! Lazy beezies the world over can rejoice about that. So, before we wrap up this long discussion of balls, I want to call your attention to one individual surprised little ball. I didn’t notice this when I snapped the picture below, but the bite I left gave that guy a face. See it?  Now, that’s all I can see when I look at that picture. There’s no way I can take a photo seriously after seeing a photo bomb like that. If you’re a big fan of protein balls like I am and just can’t get enough balls, there are tons of great recipes out there. Davida at The Healthy Maven and Lee over at Fit Foodie Finds straight up kill it when it comes to balls. 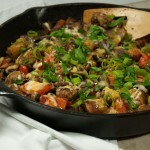 So many great recipes on those girls’ sites! Check them out. 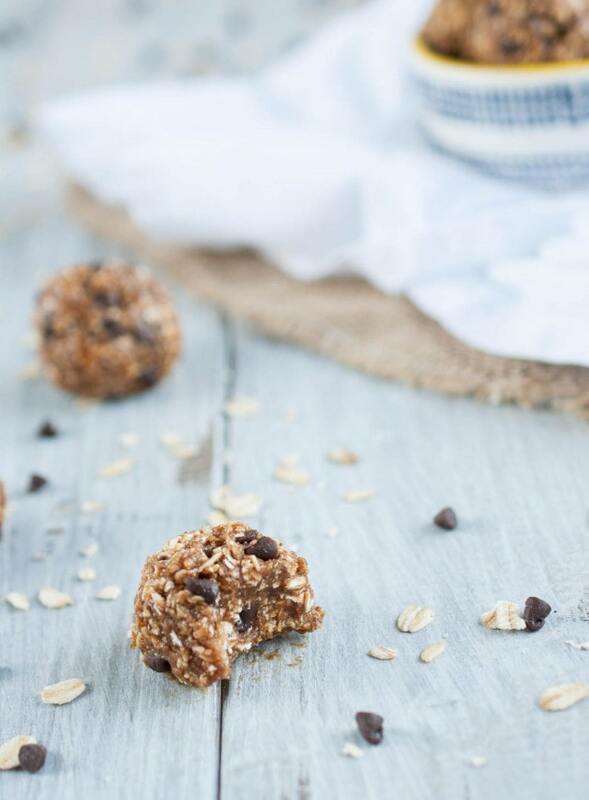 These protein balls are a foodie fad worth following. These delicious and filling protein balls taste like an oatmeal cookie, but have 4.4 grams of protein in each 100 calorie ball. Add protein powder, cinnamon, vanilla, dates, peanut butter, and water to a food processor or blender and blend until well mixed. Add oats and pulse several times to combine and mix in. Don't over mix! Add chocolate chips and pulse once to mix in. You can stir these in by hand instead if preferred. Roll into balls using about 1½ Tbsp. of dough per ball. Should make 16 - 18 balls. Refrigerate for at least half an hour to firm up. Keep in air tight container in refrigerator for 3-4 days.